The Grove by Rockwell | +639178132871 | Inquire Now! Own Your Grove Unit. 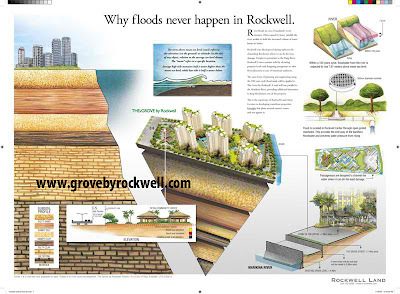 : The Grove by Rockwell - Flood Free Site! The Grove by Rockwell - Flood Free Site! When the Grove was initially planned, Rockwell studied a 100-year flood history of the location in order to properly gauge the property’s elevation. The flood level of Typhoon Ondoy reached 5.16 meters at its highest point, but since The Grove will be elevated to 7.41 meters, the elevation would have kept The Grove by 2.25 meters above the water (roughly the height of a doorway). Meanwhile, over the past 100 years, the highest level of flooding in the area is recorded at 7.6 meters above the water level of the Markina River. Should the worst case of flooding over the century recur, the water will only rise to a mere 8 inches above The Grove’s ground level. In terms of proximity to the river, the closest point The Grove is still 22 meters away; and given that Towers A & B do not have underground parking (only podium parking), there is no chance of water entering inside the parking area. The basement parking of The Grove begins with Towers C & D which is 100 meters away from the river bed. This distance naturally creates a sandbag to secure our basement level against flooding. Furthermore, pipes that function to pump out rain water will be located along the streets and not within the basement parking. In the event that a pipe bursts, water will not affect the parking area. Lastly, Rockwell Land has had experience in building water-front properties, with Rockwell Center being built within close proximity to the Pasig River. The same form of planning and engineering will be applied to The Grove by Rockwell. Upon the development of Rockwell Center, Rockwell has improved the street conditions of JP Rizal and Kalayaan Avenue to decrease the occurrence of flooding among its boundaries. Furthermore, a road that will run parallel to the Marikina River, similar to JP Rizal, is being planned; this will also provide additional deterrence that will keep floodwaters from penetrating into the development. 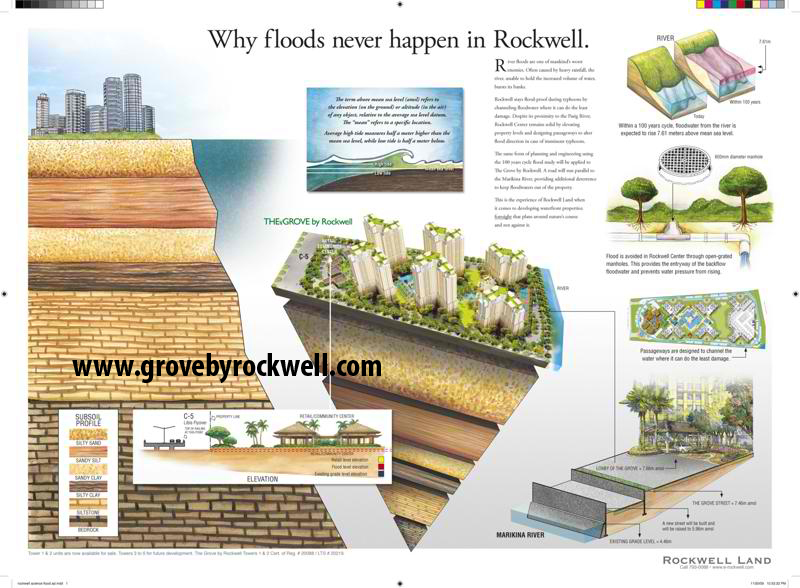 With Rockwell’s experience in being a water-front property developer, clients are can be assured that every precaution has been taken to ensure that The Grove by Rockwell will be protected against heavy flooding.